After becoming the first among developing countries to release updated greenhouse gas emissions report, India has taken another leap by releasing a “4X4” assessment of the impact of climate change on key sectors and regions across India in 2030s. The Report titled “Climate change and India: A 4X4 Assessment”, provides an assessment of impact of climate change in 2030s on four key sectors of the Indian economy in four climate sensitive regions of India. These are Agriculture, Water, Natural Ecosystems and Biodiversity & Health for the Himalayan region, the Western Ghats, the Coastal Area and the North-East Region. The Report has been prepared by the MoEF led Indian Network for Climate Change Assessment (INCCA). While releasing the report, Environment Minister Jairam Ramesh shared his concern by stating, “There is no country in the world that is as vulnerable, on so many dimensions, to climate change as India is. This makes it imperative for us to have sound evidence-based assessments on the impact of climate change.” Also present at the occasion was Shri Kapil Sibal, Union Minister for Human Resource Development, Science and Technology and Earth Sciences who shared similar sentiments. “The impact of global warming in one part of the country is different from the other part of the country. We need micro study and micro assessment which will make difference in lives of people.”, he said. The 4×4 Assessment examines the implications of climate change for India in 2030s deduced from a Regional Climate Model Had RM3 (Hadley Centre Regional Model Version 3) run for A1B scenario. It covers climate change projections, sea level rise and extreme events, agriculture, water forests and human health at macro level. Mr. Ramesh also informed the uniqueness of the efforts of such a comprehensive, long term assessment. “It is also for the first time that an assessment has been made for the 2030s where as all previous assessments were for the 2070s and beyond.” he informed.The finding of the report will surely be critical in sustaining India’s development for all sections of the society in all regions of the country. Dr. M S Swaminathan , Member of Parliament, Rajya Sabha, who also presided at the release function advised to train two ‘Climate Managers’ at lowest institutional level like panchayat whose suggestions will help in sustainable agriculture. The data they provide will have to be involved in this Assessment work by agricultural scientists as the rise in rise of surface, change in rain patterns, temperature etc are affecting agriculture produces. The Ministry proposes to bring out a third report of this network in November 2011 which will look at the impact assessment on India’s carbon aerosol (black carbon) programme. 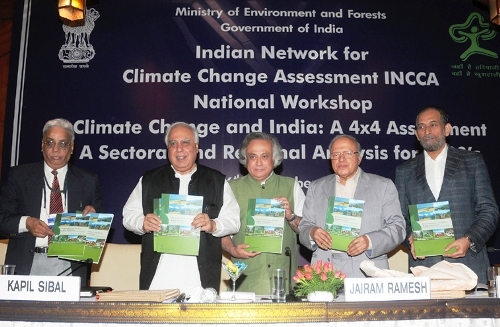 The Fourth Report will come out in May 2012 and it will be an Assessment at the level of 16 Agro – climatic Zones. Climate change scenarios for 2030s indicate an overall warming for all the regions in focus. The net increase in annual temperatures in 2030s with respect to 1970s ranges between 1.7oC – 2.2oC, with extreme temperatures increasing by 1-4oC, with maximum increase in coastal regions. The extreme maximum and minimum temperatures are also projected to increase in 2030s with respect to 2070s. All the regions are projected to experience an increase in precipitation in 2030s with respect to 1970s and the increase is maximum in the Himalayan region and minimum increase in the North Eastern region. The extreme precipitation events are likely to increase by 5-10 days in all the regions. Sea level along the Indian coast has been rising at the rate of 1.3mm/year and is likely to rise in consonance with the global sea level rise in the future. Further projections indicate that the frequency of cyclones is likely to decrease in 2030s, with increase in cyclonic intensity. Irrigated rice in all the regions are likely to gain in yields marginally due to warming as compared to the rainfed crop as the irrigated rice tends to benefit from CO2 fertilization effect. Maize and sorghum are projected to have reduced yields in all the regions. The Coconut productivity is projected to rise in the western coast and reduce in the eastern coastal region. Observations indicate a reduction in apple production in the Himalayan region, which is likely to continue in the future. In case of marine fisheries some species will gain in yields, as the warming favours their productivity such as Sardines. Some species like Indian mackerel are likely to move upwards to the northern latitudes thus maintaining their yields. Species like Threadfin breams, may shift their spawning seasons adjusting to the season which optimally favours spawning temperatures. With overall warming, the thermal humidity index is projected to increases in all the regions, especially in the months of May and June, leading to stress to the livestock and hence reduction in its milk productivity. Water yield (which is a function of precipitation, total surface run off, evapotranspiration and soil properties), is projected to increase in the Himalayan region in 2030s by 5-20%, however, water yields are likely to be variable across the North Eastern region, Western Ghats, and Coastal region. In some places in these regions, it is projected to increase and in some places it is projected to decrease. Himalayan region, as compared to the other regions. All the regions are likely to experience flooding which are exceeding existing magnitudes by 10% to 30%. Change is projected for 8% 18%, 56%, and 30% of the vegetation grids and increase in Net Primary Productivity by 23%, 20%, 57%, and 31% is projected in Western Ghats, North eastern region, Himalayan region, and the Coastal region. Malaria is projected to spread in new areas in Jammu and Kashmir in the Himalayan region. In the North eastern region opportunities for transmission is likely to increase for a longer period. In the Western Ghats, no change is observed between in 2030s and the trends observed in 1970s. However, in the Coastal region, especially in the eastern coast a marked decrease in number of months is projected in which that the malaria transmission window would be open.